Have no idea about how to transfer files from iPhone to Mac? It doesn't matter. Follow this guide to check top 4 ways of transferring iPhone files to Mac effortlessly. Just choose the one that works best for you. As University Herald noted, Macbook Pro 2016 will be very likely launched alongside the new iPhone 7. That means there will be another peak of syncing files from iPhone to Macbook Pro 2016 for iPhone data backup after the new Apple computer released. But how to transfer iPhone files to Mac? There are lots of ways to do this, and which method you choose may depend on the type of file, or how you manage your workflow. Here are top 5 ways to transfer iPhone files to Macbook Pro/Air, iMac. Just scroll down and pick the most suitable way for you. Transfer iPhone Files to Macbook Pro? Right Place You Got! 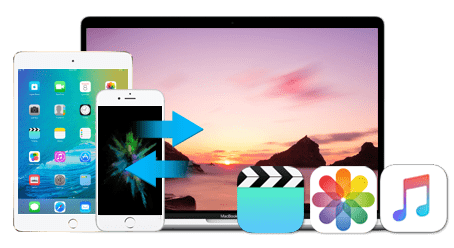 MacX MediaTrans - it lets you transfer iPhone (iPhone X/8/7/6S/SE/6 Plus) music, photos, videos and more to iMac, Macbook Air, Macbook Pro 2016 etc. with one click. No iTunes & iCloud limitations! If you are intend to copy photo, music, video from iPhone SE/6S/6 Plus to Mac, there is nothing better than MacX MediaTrans to do so. It's an efficient iPhone to Mac transferring tool, allowing you to move files from iPhone to Macbook Pro/Air, iMac etc. at super fast speed, specially only 8 secs for 100 4K photos. Furthermore, it also features as an iOS 10 iPhone files manager. You can not only selectively get iPhone photo, music, video backup to Mac, but also import music/video from Mac to iOS 10 iPhone iPad iPod; edit iOS iPhone 7 music on Macbook Pro 2016; mount iPhone as flash drive etc. This guide shows you how to sync music from iPhone 7/7 Plus/SE/6S/6 Plus to Macbook Pro/Air with the iPhone files transfer. Similarly, the same steps applies to copy iPhone photos and videos to Mac/Windows for eternal files backup. BTW, you are allowed to sync files from iPhone to Mac without iTunes, remember to turn off the iTunes auto sync as the iTunes setting window pops up. 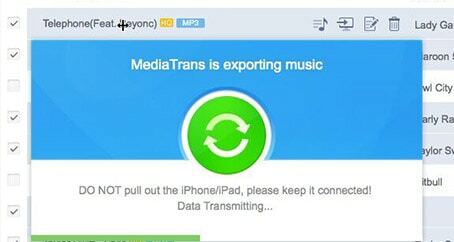 Free download MacX MediaTrans and launch it on Mac. Connect your iPhone SE/6S/6 Plus to Mac with a USB cable then click "Music" icon to enter the music interface. 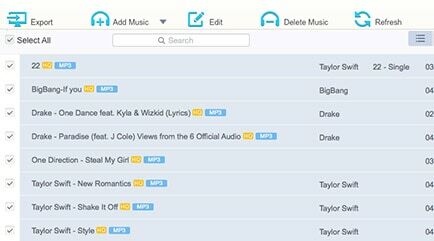 All the iPhone music songs, playlists will be presented in the main window. Select the iPhone songs you wanna copy from iPhone to Mac or Windows. Tap "Export" button to back up iPhone music to Mac computer. Deleting redundant iPhone music, creating playlists, batch editing info can also be done with the iPhone to Mac syncing tool. 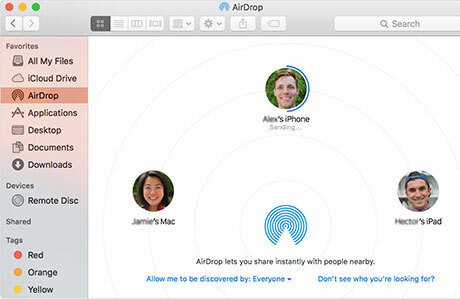 With AirDrop, you can wirelessly send photos, videos, websites, locations, and more to a nearby iPhone, iPad, iPod touch, or Mac. 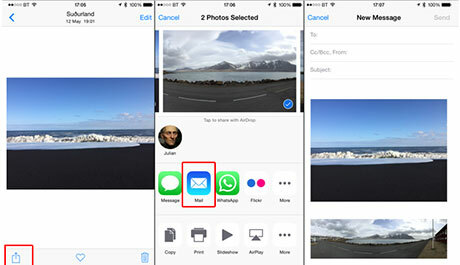 It is Apple's technology for sharing files across devices, making it a trifle to transfer files from iPhone to Mac. On Mac computers, choose Go from the menu bar in the Finder. On iOS devices (iPhone, iPad, or iPod touch) open Control Center by swiping up from the bottom of the screen. Then your iPhone SE/6S needs to be awake for AirDrop to be active. On the Mac, drag a file onto the icon for your iPhone in the AirDrop window. 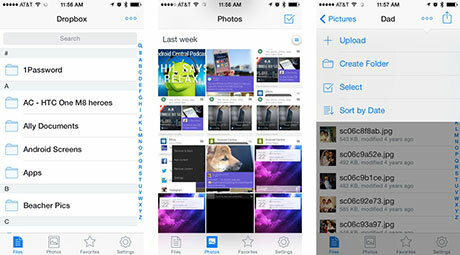 On your iPhone, you'll see a menu offering to open the file; this menu lists the apps that can open the file type. Sending emails is a traditional way to import iPhone files to Mac. Just create a new email addressed to yourself and add the file(s) as attachment to the message. Tap the attachment in the message to download and then open the file. And There must be a good connection of network or Wi-Fi, if you choose this way for iPhone files transfer. But depending on the file type, you may or may not be able to open files on your Mac computer. Still, sending emails is also available to importing files from Mac to iPhone. Cloud service such as Dropbox, Google Drive, Box, etc. are widely used to save, backup and move files from iPhone to Mac these years. Here takes Dropbox as an example. The coolest thing about Dropbox is the ability to access your important files from anywhere on multiple machines or devices. 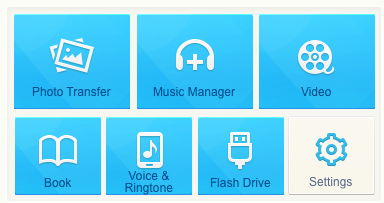 If you use Dropbox, you can set it up to have all your photos automatically upload to Dropbox which has the advantage of automatic backup copies, and they get synced to your computer as well. To copy and move iPhone files to Mac, this iPhone manager is the best option, for it enables you to transfer iPhone, backup iPod and manage iPad iOS 10/9/8 with greatest of ease.